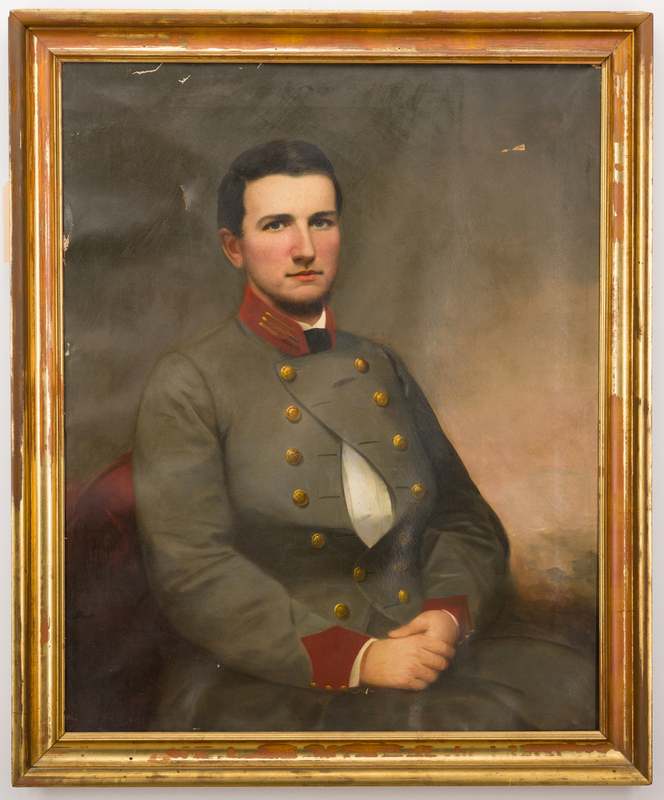 1st item: Portrait of Captain Elisha Eldridge Wright of Tennessee, b. 1840-d. 1863, Battle of Stones River, also known as the second Battle of Murfreesboro, Tennessee. 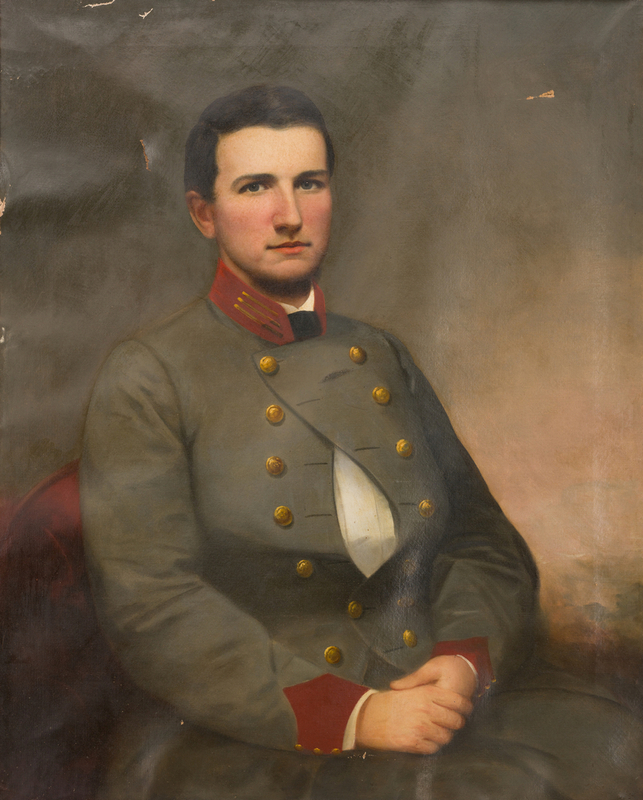 Wright is depicted as a handsome young dark-haired soldier, seated and wearing his Confederate Army Uniform. Original molded giltwood frame. 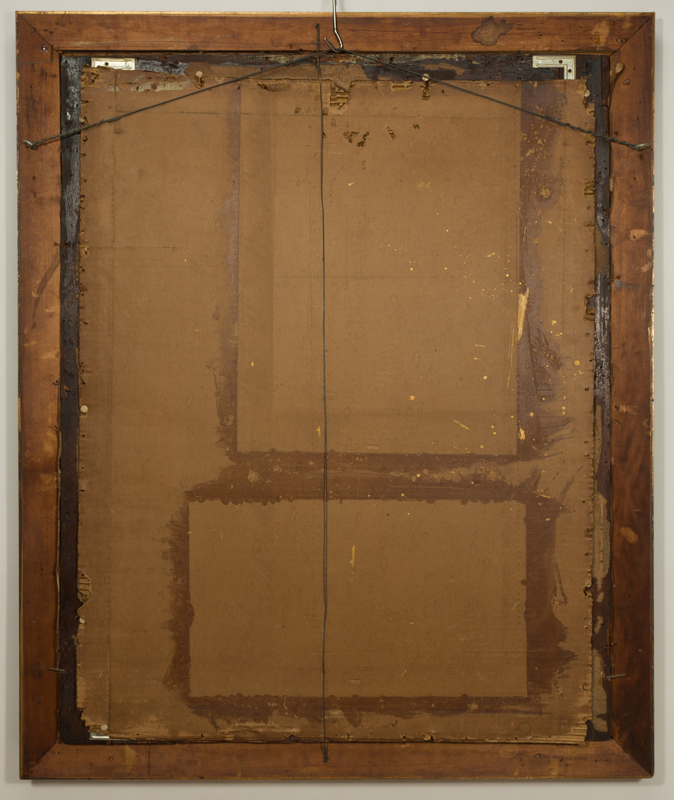 40" x 31" canvas, 45" x 37" frame. 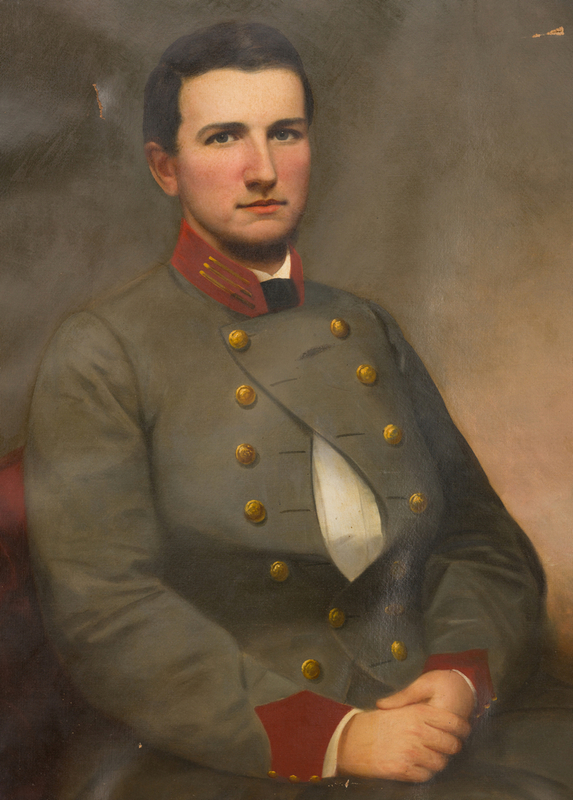 Captain E. Eldridge Wright, as he was best known, was born in Giles County, Tennessee, on Aug. 22, 1840 but moved with his family to Memphis in 1850. Following the outbreak of the Civil War, Wright organized what would become known as Wright's Battery (later known as Phillips' Battery), Johnson's Light Artillery, in Hardin County, Tennessee, in October, 1861. 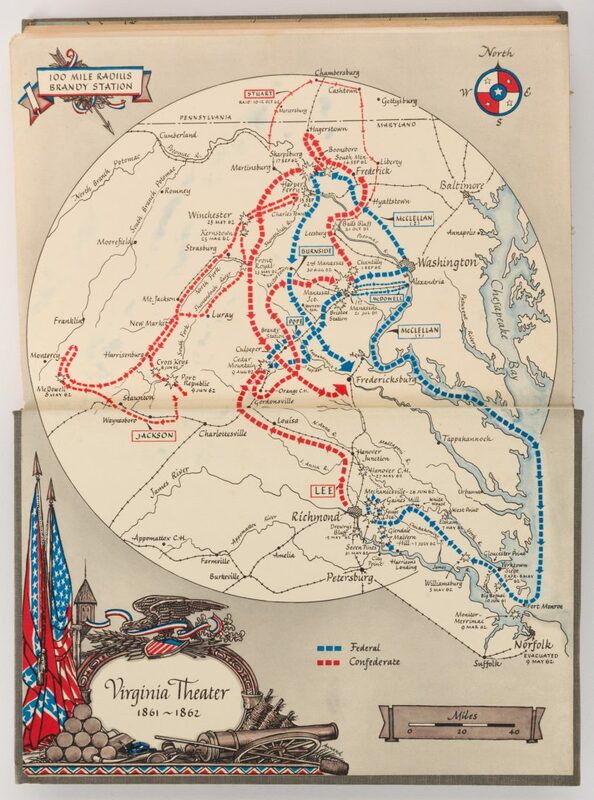 Some of its men came from Fayette and Wayne counties (source: National Park Service). 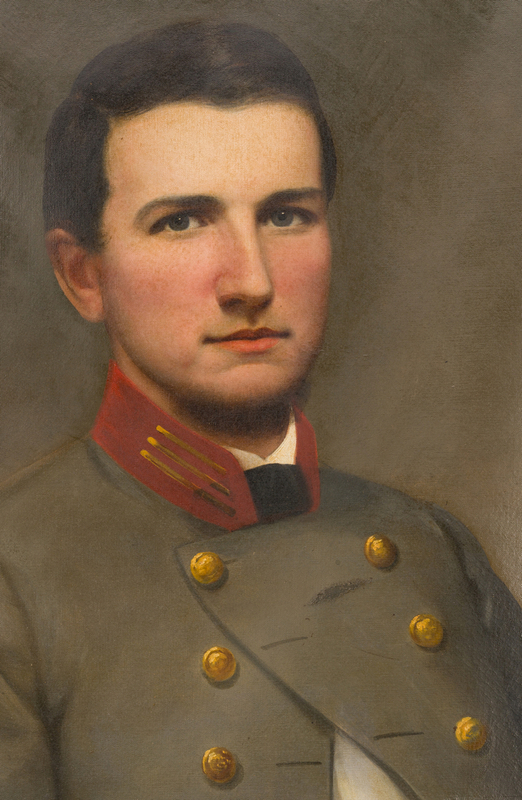 One of the men under Wright's command was his younger brother, Luke Edward Wright. The unit served in Mississippi and, at the end of December, 1862, found itself at the Battle of Stones River in Murfreesboro. 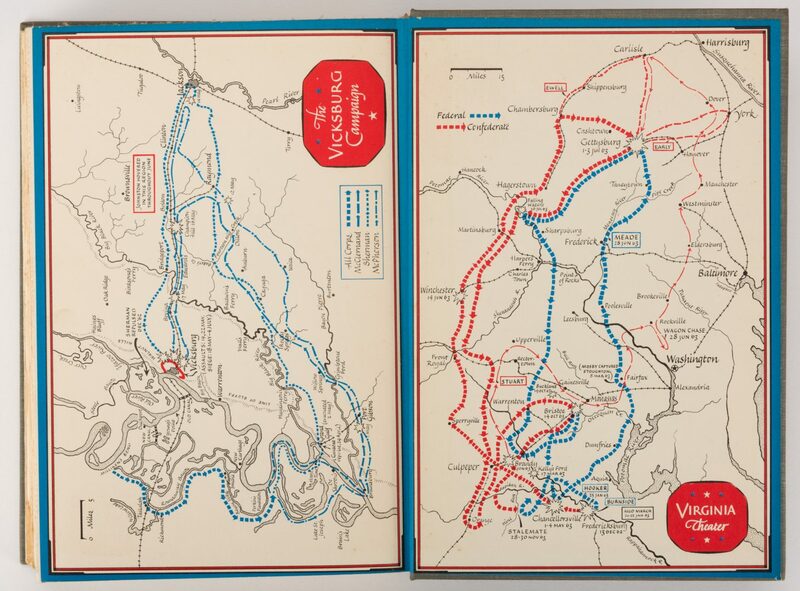 On Dec. 26, 1862, the Union Army under Gen. Rosencrans marched from Nashville to challenge the Confederate Army, commanded by General Braxton Bragg. 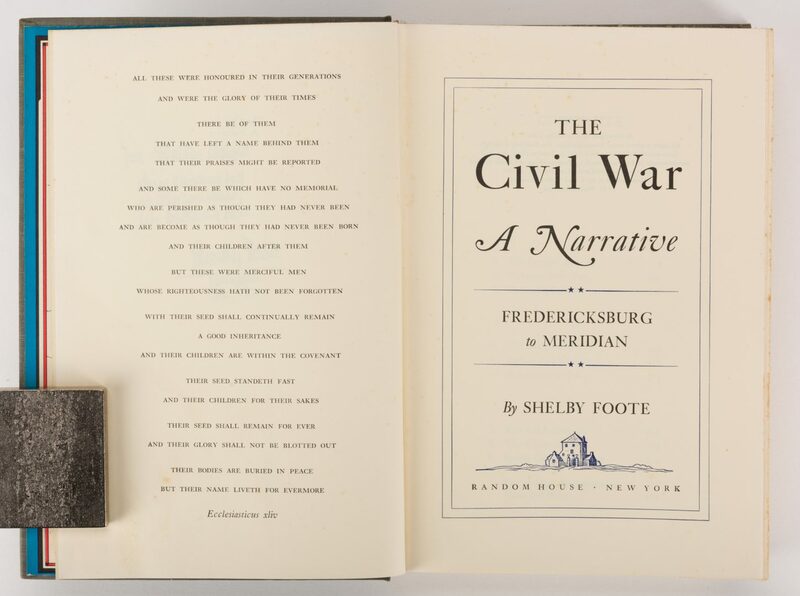 The battle that resulted from Dec. 31, 1862- January 2, 1863 was the culmination of the Stones River Campaign in the Western Theater of the Civil War, and of all the major battles of the war, it had the highest percent of casualties on each side. Captain Wright's valor is described in multiple period and post-war accounts, but a 1908 article in Pearson's Magazine, telling the story from the viewpoint of Wright's brother Luke, relates the events of January 2, 1863 in this manner: "As the Confederate Ranks broke and fled under the iron storm from the Union guns, Wright's battery stood its ground in the deserted field. 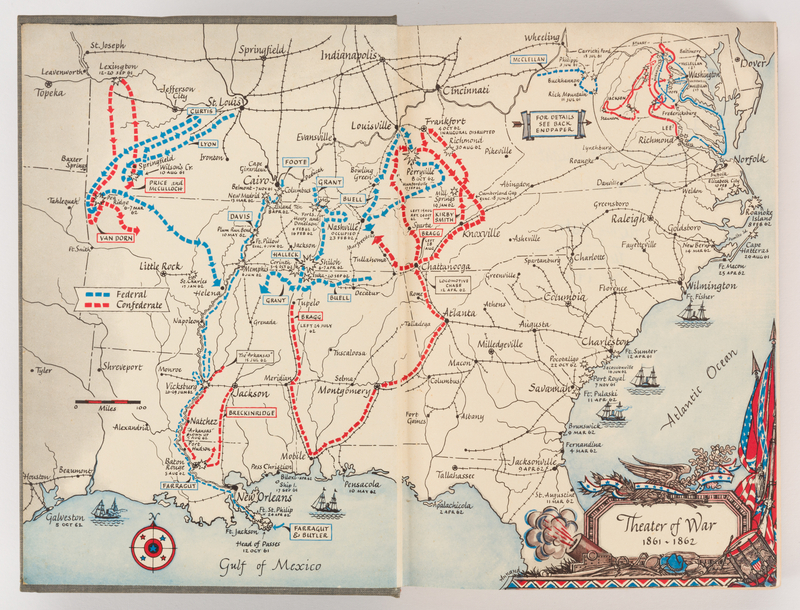 Captain Wright was so intent on smashing his foes he took no heed of the fact that the rest of the Confederate Troops had retired. Under his orders the guns were even pushed forward by hand. Again and again the battery poured canister into the advancing Union lines. 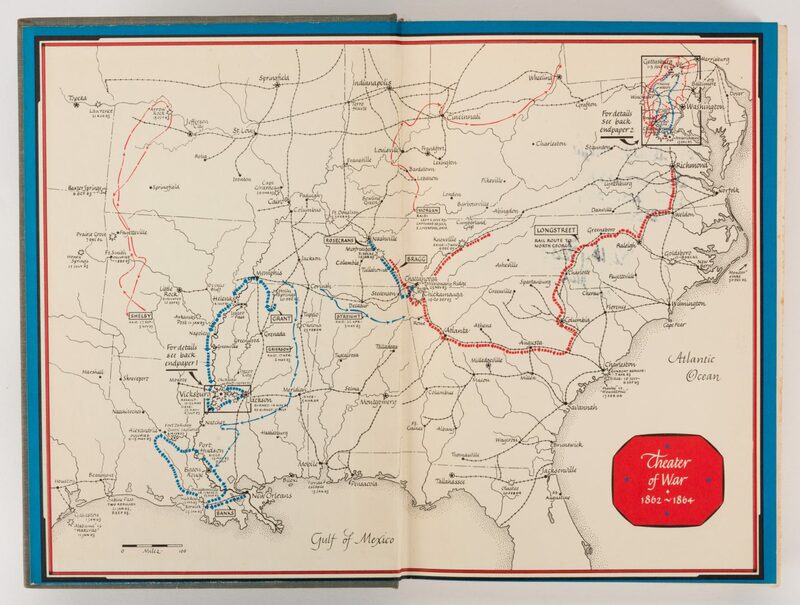 While the handsome artillery captain sat his horse and urged his men to keep their guns going for the honor of old Tennesse, his young brother, Luke… stuck valiantly to the gun he commanded, loading and firing when the enemy was so close that he could recognize their faces. Suddenly Captain Wright tumbled dead from his horse. Even after that the young sergeant continued to serve his guns." Wright's battery lost 6 killed, 14 wounded, and 2 missing at Murfreesboro. 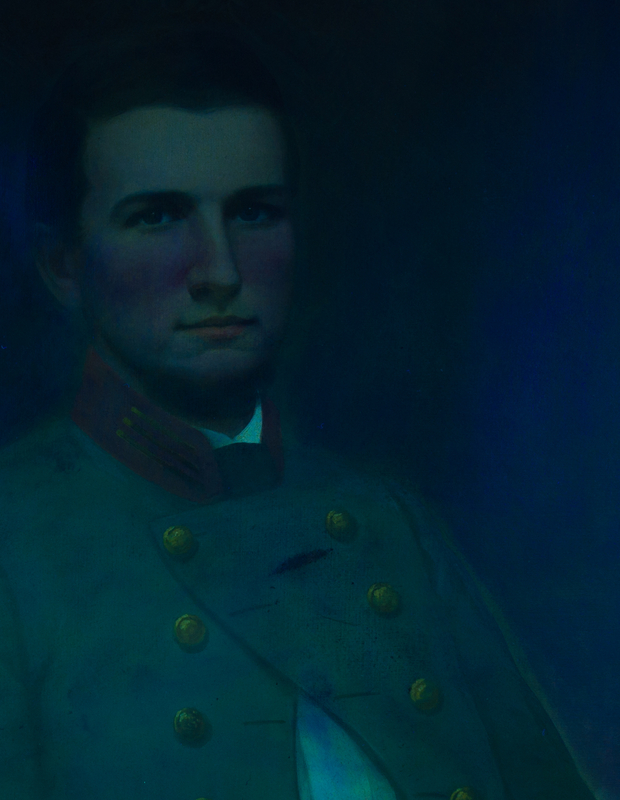 Young Luke E. Wright earned a second lieutenant's commission for his bravery in the face of his brother's death. (Luke would survive the war and go on to become a Memphis attorney, Civil Governor of the Phillipines, the first full U.S. Ambassador to Japan, and Secretary of War under Theodore Roosevelt). 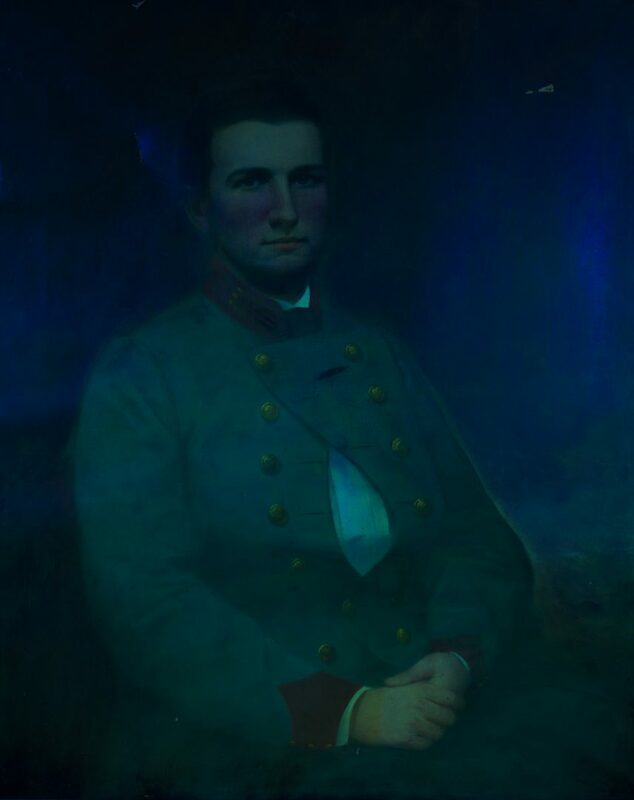 This portrait is said to have been painted from a photograph shortly after Captain Wright's death. The artist is likely Washington Bogart Cooper of Nashville or James Hart of Memphis. 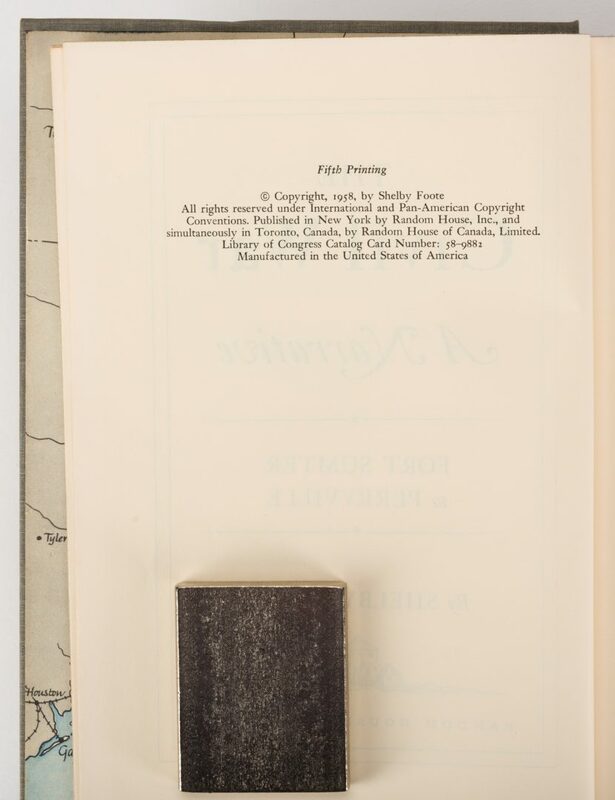 Provenance: the estate of Luke Eldridge Wright (Capt. Wright's great-nephew), Memphis, Tennessee. 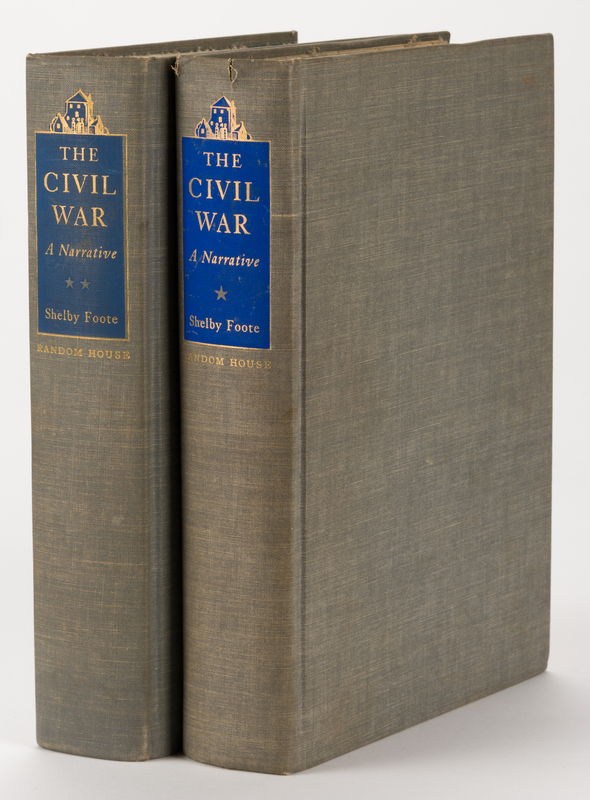 2nd & 3rd items: 2 author signed and inscribed volumes of the 3 book set "The Civil War: A Narrative" by Shelby Foote, published 1963, Random House, New York. 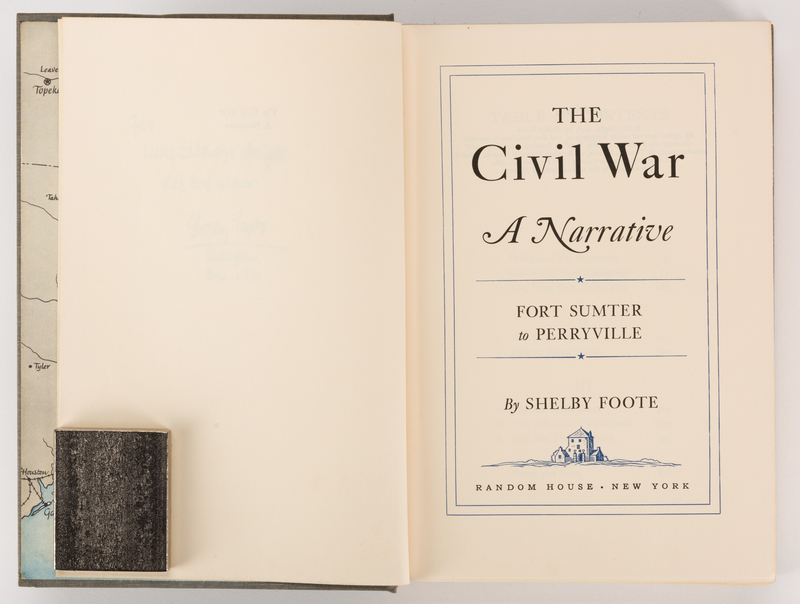 Volume titles include Fort Sumter to Perryville (Volume 1) and Fredericksburg to Meridian (Volume 2). 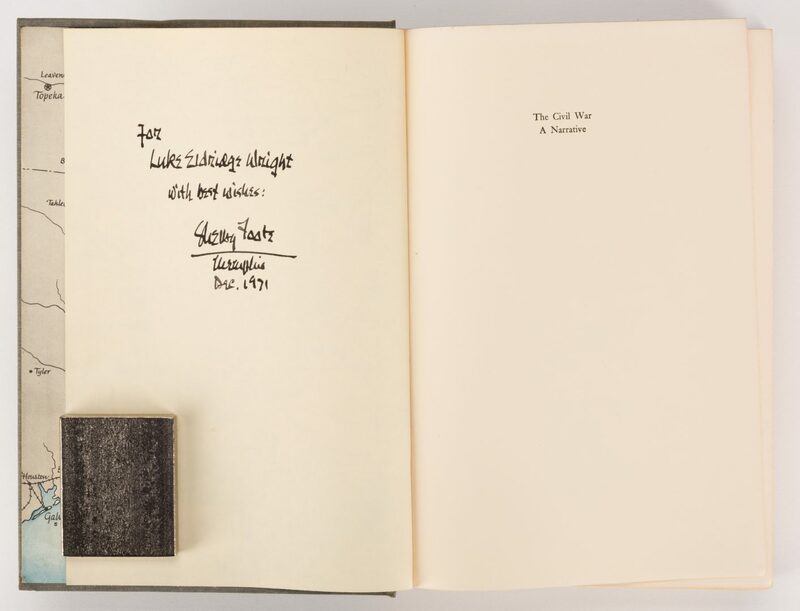 The first book is signed on the free endpaper "For Luke Eldridge Wright with best wishes: Shelby Foote/Memphis/Dec. 1971" and the second book is signed on the free endpaper "For Eldridge Wright whose kinsmate fell at Murfreesboro, Late December 1862. Shelby Foote/Memphis/Dec. 1971". CONDITION: 1st item: Painting is on original canvas and is loose in frame. 1 1/4 " tear upper right quadrant, background. 4 deep scratches with paint loss to upper left quadrant, background, largest is 2". 1 1/2" tear with paint loss at left edge opposite subject's ear. 3 small areas of wear with paint loss at lower left edge and lower center (largest 1" on wrist). Repaired tear to chest, 1 1/2". Stretcher reinforced at corners. 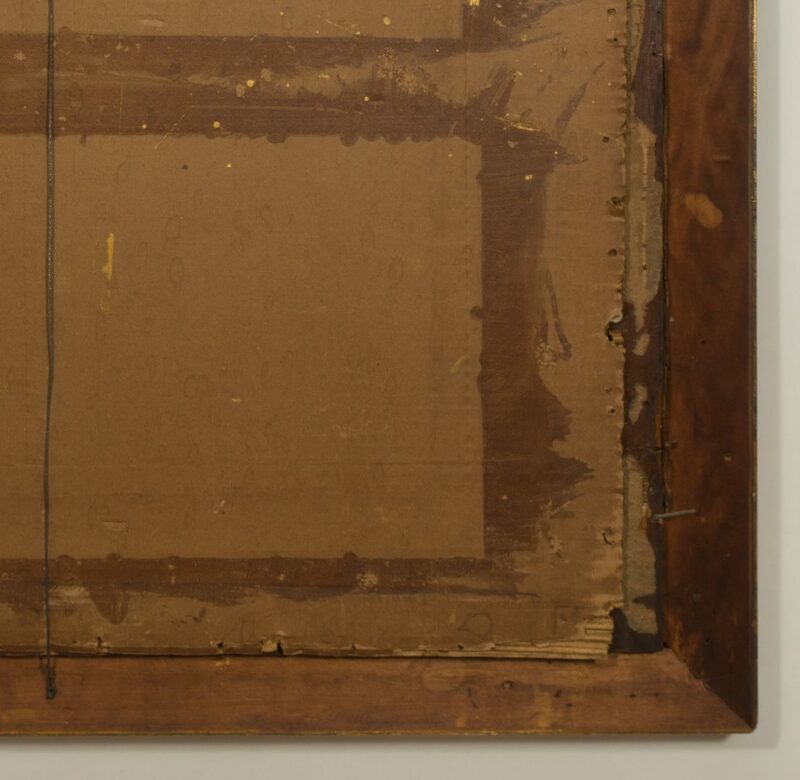 Frame has separation to inner and outer molding along entire top edge and part of right edge; extensive losses to original gilding. 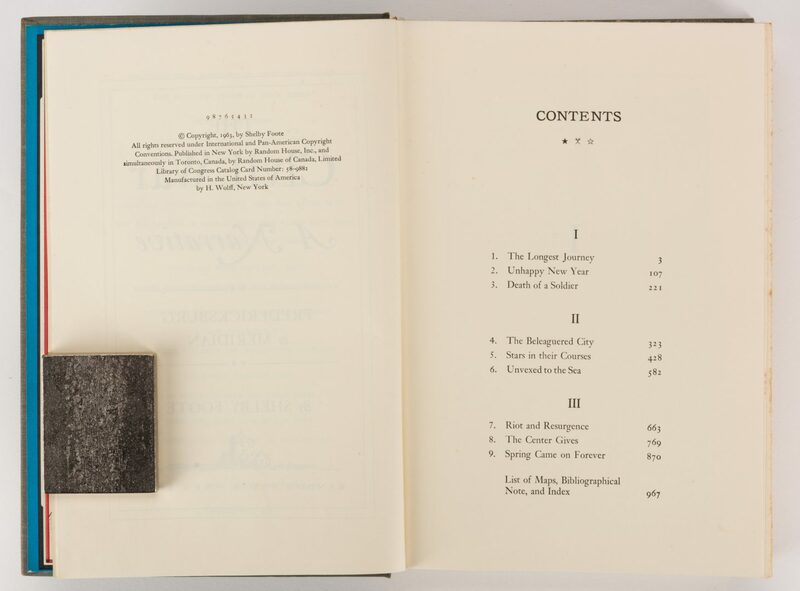 2nd & 3rd item: 1st volume with light wear to cover, some slight wear/fraying to top of spine, fore edge with toning. Clean, bright interior. 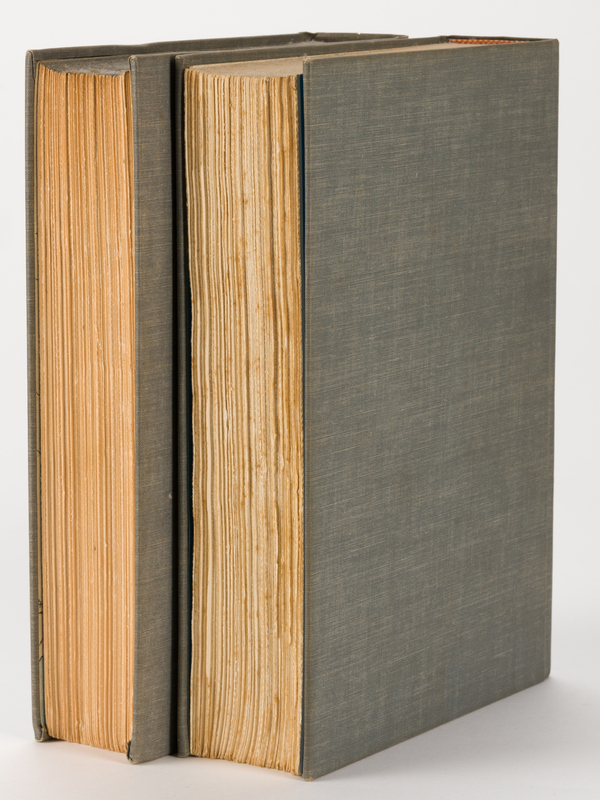 2nd volume with light wear to cover, slight foxing to fore edge, overall very good condition with clean, bright interior.